I've bought and tried various types of glassware for cocktails. 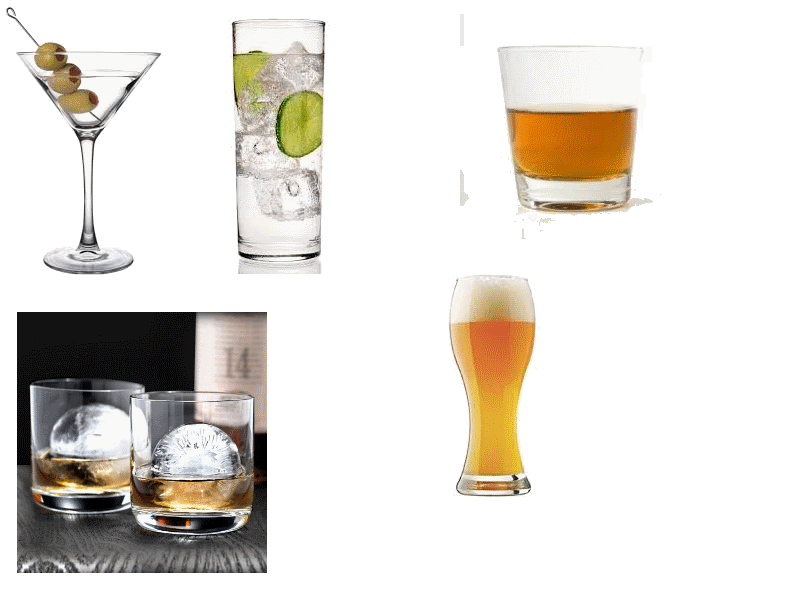 Glasses for typical shaken drinks include a cheap martini glass (165 ml), a nick and nora style glass and a coupe (125 ml), among others. This matches with sizes found in shops around the web, where they might even go higher in volume. However, the basic recipes for cocktails tend to end up a lot smaller, to the point where it looks silly in a glass. For example the "IBA Official" Aviation Cocktail calls for 75 ml of spirits and juices, and shaking over ice (using 30mm square solid cubes, about 5 to 6) will not dilute it to 125 let alone 165 ml of fluids. Obviously I can just scale up ingredients proportionally. But given that "typical" cocktail glasses don't match up with "typical" cocktail recipes, I feel like I'm making a mistake. So my question is: how do you go from a typical cocktail recipe (with around 75 ml of ingredients) to a typical 125-165 ml final product? In my examples above the sizes are for the liquids, assuming around 10% of leeway. So for example the martini glass is 165 ml, but around 180 ml when filled up completely. Despite what many bars, convenience stores, and fast food restaurants would have you believe, drink glasses are not intended to be "filled to the brim" (or even close). This is particularly true of cocktails and other spirits. The 'head space' allows the drinker to swirl (or, if they have had a few, 'slosh') the drink around to remix the cocktail ingredients as they seek the bottom of the glass. Any water that has melted into the drink will be diluted into the mix, and the drink may be more directly exposed to any remaining ice in order to chill the liquid just as it is consumed. Thus, the 'standard glass' has been designed to exceed the standard drink. Of course, always wanting 'as much as we can get' people tend to expect their neat scotch to be filled to the brim...just like the self-serve uber-drink from the local gas station. Even a beer glass (a pilsner) is designed to make room for a head on the 'proper' serving. People's understanding of what "one" cocktail is have varied over the years. See for example this article, which, fittingly enough, discusses nick and nora glasses. The trend towards larger drink sizes has been consistent over the 20th century for both alcoholic and nonalcoholic drinks. I won't go into idle speculation why it happened, but it shows that sizes are not really fixed. I wouldn't be surprised if the standards body of a professional society tries to deviate less from tradition and prescribes smaller sizes than the ones which are commonly used nowadays, while glassware manufacturers' marketing departments go with the trends or even lead/create them. This is just one factor leading to the discrepancy, there probably are more like Cos Callis' answer shows. Glasses come in all sizes. Desired drink size come in all sizes. I would not worry about that. Obviously the answer is to scale up. You are not going to go from 75 ml to 125 ml without scaling. It is easier to scale up than down. That is 5 parts. Chose the part size to get what you want. If you use a 1 oz jigger you get 5 oz which is about 150 ml. In the US common jigger sizes are 1/2 oz, 1 oz, and 1.5 oz. 4 oz is kind of small. Does not mean that is the intended size. It is just the ratio. If you want a bigger glass use a 1.5 oz jigger. Even bigger use 1 oz and just double everything. I you want a pitcher use 1 cup as a jigger. Not the answer you're looking for? Browse other questions tagged cocktails or ask your own question. Carbonated drinks in cocktail shakers? How much is a “glass,” in an old English cocktail recipe (1930)?